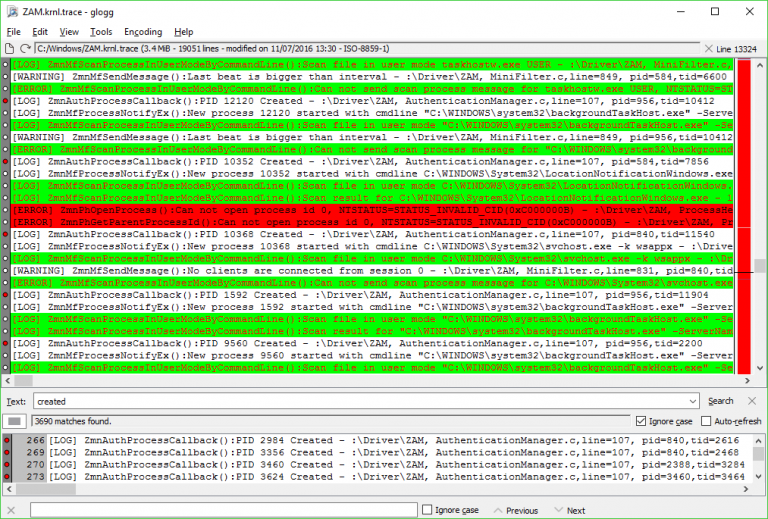 Glogg is an open-source tool for viewing and searching even the largest and most complex log files. The program opens files very quickly, because it reads data directly from disk and doesn’t try to load it entirely into memory. It’s a smart move which also means there’s no limit on the size of files you can view. Glogg’s interface is simple and uncluttered, allowing anyone to use it as a plain text viewer. Open a log, browse the file, and the program grabs and displays new log lines as they’re added. There’s also a search box. Enter a plain text keyword, a regular or extended regular expression and any matches are highlighted in the main window and displayed in a separate pane. Enable "auto-refresh" and glogg reruns searches as lines are added, ensuring the matches are always up-to-date. Glogg also supports "filters", essentially canned searches which change text color in the document window. You could have lines containing "error" displayed as black on red, lines containing "success" shown black on green, and as many others as you need. Scanning the documentation reveals a few other handy extras. To run a quick text search, for instance, type / followed by a keyword, like /process. Matches are highlighted and visible at a glance, or you can click Next/ Previous buttons to step through them. Glogg isn’t exactly weighed down with features, but overall that’s probably a good thing. Beginners can use the program some simple tasks, maybe just to open a large text file quickly, while experts will appreciate the filters and extended regular expression support. Glogg is an open-source application for 64-bit Windows 7 and later and Linux.